Legend Reba McEntire and Christian singer Lauren Daigle gave a powerful performance of McEntire’s song “Back To God" at the 2017 ACM Awards. Ethan Miller/Getty Images Lauren Daigle and Reba McEntire perform onstage during the 52nd Academy Of Country Music Awards at T-Mobile Arena on April 2, 2017 in Las Vegas. The two artists debut their duet onstage at the T-Mobile arena for the 52nd ACMs Sunday night. 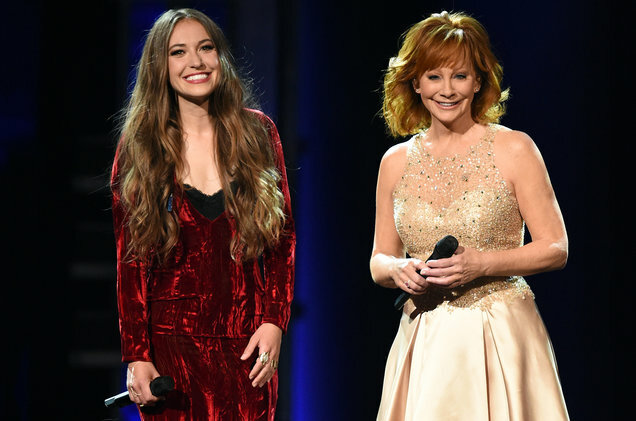 Country music superstar Reba McEntire was joined onstage by Christian music sensation Lauren Daigle for their new version of the song “Back to God” at the 52nd ACMs on Sunday night. Dressed in elegant gowns and belting a powerful duet, McEntire ended the performance vividly choked up over the song's meaningful lyrics. The powerful song was originally released on McEntire’s latest album, Sing it Now: Songs of Faith & Hope, and marked the country singer’s 13th No. 1 song, topping both the Billboard Country and Christian/Gospel charts. The music video has up to 5.8 million views thus far. Following the performance, the song was digitally released for purchase. McEntire has won 13 ACMs and hosted the ceremony for a record 17 times. Other performers of the night included Luke Bryan, Miranda Lambert, Carrie Underwood, Keith Urban and more. Bryan and Dierks Bentley returned to host the ceremony for the second year. The ACMs aired live from the T-Mobile Arena in Las Vegas on Sunday on CBS. It’s one of the most anticipated ACM Awards moments, and Reba McEntire did not disappoint. Riding high off the success of her gospel album Sing It Now: Songs of Faith & Hope, McEntire took Las Vegas to church with an amazing performance of her latest single. The red-headed singer announced her performance on March 22 via a Facebook video announcement. McEntire’s gospel album included two discs, one of which was filled with traditional hymns, while the second is all original songs. “Back to God” is included on the second disc and was written by Randy Houser and Dallas Davidson. McEntire and Daigle’s voices sounded beautiful together and we wouldn’t be surprised if some future collaborations are in the works now! 0 Response to "Reba McEntire & Lauren Daigle Give Powerful Performance of 'Back To God' at the 2017 ACM Awards"